It’s late. 6:30. The sun is coming up. I haven’t slept this late in ages. About how well our day went yesterday as we caught up on cleaning and tidying the basement. For my 9 year old son who was so helpful yesterday – he cleaned up Legos, helped put away boxes, made pizza for dinner, emptied the dishwasher with me, and made cookies for snack. The Terrible Tragedy of the Healthy Eater. I started updating my price book yesterday afternoon for Frugal Local Kitchen. I let it go for too long. With farmers markets opening up way too soon, I want to make sure I have a cash reserve to take care of deals this spring and summer to compensate for a smaller vegetable garden. Greenbacks Gal is one site I’ll be following more closely to help me save money on groceries. We share a similar philosophy towards food, plus I need to learn more about saving money on real food at Costco and Whole Foods. In other news, I have found a great hair stylist at my local Haircuttery. For $14, I get a wash, cut, and blow dry, plus the hair cut grows out well. Money well spent! Even though I decided not to do a pantry inventory after cleaning out old homecanned goods yesterday, I AM going to do a freezer inventory. A discussion with the kids yesterday about their favorite snacks reminded me I still have shredded zucchini in the freezer, not to mention other foods that could be made into snacks. I also need an inventory of the meat and side dishes like cooked rice to help with meal planning. I am so excited to see my 9 year old taking the lead in the kitchen! 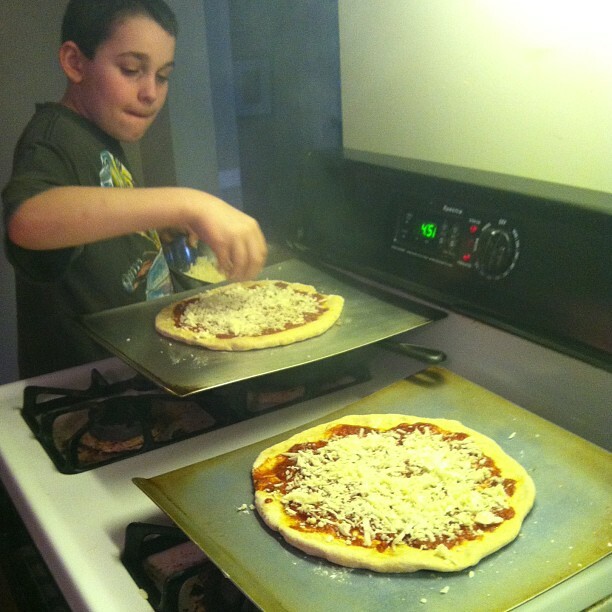 He made pizza dough and oat cookies by himself yesterday. a new home management binder, one page and one section at a time with the help of ListPlanIt and my pages from my previous home management binder. Once I have the pages together, then I’ll get them bound at Kinko’s for $5. to stay home and enjoy my Sunday. Maybe a quick trip to the library later? all my recent Kindle freebies. I need to remove the ones I don’t want to keep – funny! Decluttering the Kindle! It’s been almost a month since I severely sprained my ankle. I am amazed at how much my foot still hurts, and how many black and blue marks still remain. for a great week! March is coming along with the 2013 Philadelphia Flower Show! Holiday decorations decluttered and put back in the attic. Arts and crafts caddy decluttered – great job for a 6 year old! She checked all the markers for me to see which ones were dead or almost dead. Basement tidied of toys. We did our first cleaning hour yesterday. Note to self – either wake up teenager early to participate or don’t wait for him. The first time only took about 20 minutes or so. I kept the list short since we spent quite a few hours working on the basement and other projects. I started my spring gardening list. I prune roses and fruits trees in late February and early March. My new camera and zoom lens. Pinewood Derby, the last week of Girl Scout cookie sales, and working on projects at home. Disclosure: I am an Amazon Associate, ListPlanIt Affiliate, and a Tell Your Time Affiliate. Love Greenbacks Gal! Do you get Southern Savers in email? They list all of the stackable Whole Foods deals to see how you can get even more off of the regular coupons that they are running. No, I don’t. I’ll check them out. My plan is to do a monthly trip to Costco and Whole Foods at the same time since they’re close to each other in Glen Mills.